A version of this recipe has been on my blog for several years, but it’s waaay back in the archives. And it was sharing a post with the orange julius recipe, which made it sort of inconvenient to just look up the strawberry syrup recipe. Also, I’ve modified the recipe a bit to be lower in sugar, so it needed updating anyway. 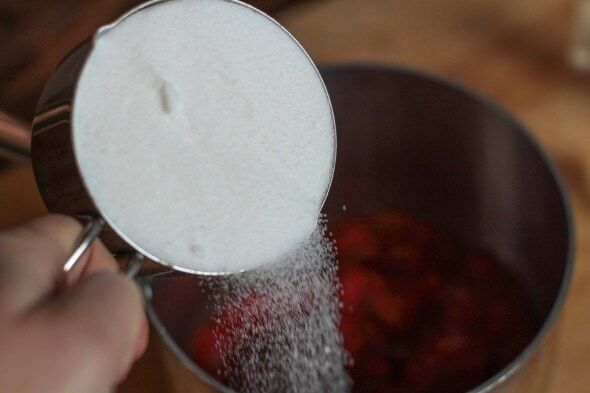 This syrup is quick to make, it only requires three ingredients, it has no high fructose corn syrup, and it’s a lot cheaper than the ready-made strawberry syrup you can buy in the store. A cup of sugar ($0.21) and 2 cups of frozen strawberries ($1.04) yields almost a quart of syrup. The water and the teeny amount of electricity you need to make this are negligible in price, so I’d say a quart of this costs right about $1.25. You can use fresh strawberries to make this, of course, but frozen berries are available year round, and they are almost always cheaper than fresh anyway. 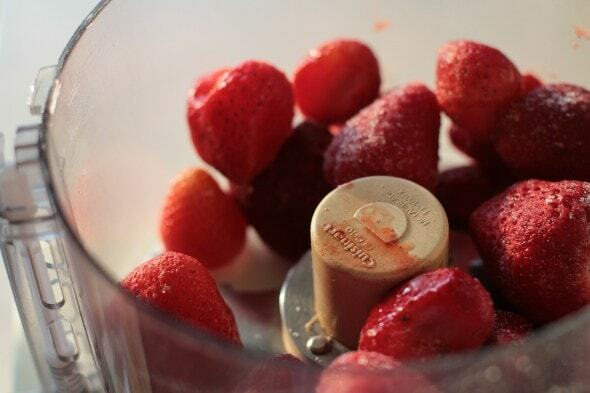 To start out, thaw 2 cups of frozen strawberries and then use your food processor or blender to puree them. You can leave a few berry bits if you’d like, or you can process the berries until they’re completely smooth. 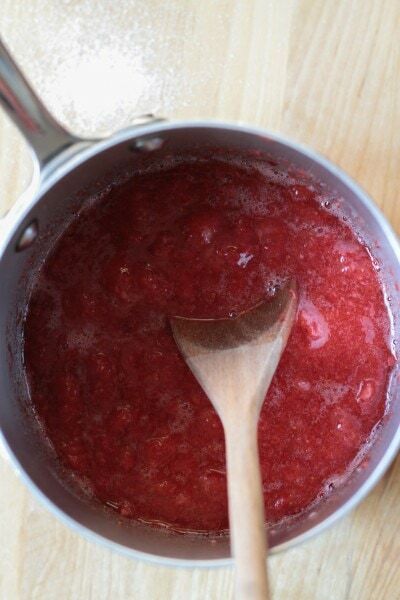 Scrape the berries into a small saucepan and add 1/2 cup water and a cup of sugar. The original recipe called for 2 cups of sugar, but I’ve decided that’s unnecessarily sweet. A cup works just fine. Bring the syrup to a gentle boil over medium heat, and boil for 5 minutes, or until the syrup has thickened a bit. It’ll be bright red at first, and then it’ll darken as you cook it. This is not a super thick syrup when it’s hot, but as it cools down, it’ll thicken to the consistency of real maple syrup. My kids like it either way! To store leftovers, pour the syrup into a glass jar and keep it in the fridge. The longest we’ve kept ours is a week, but I imagine it’d last longer than that, given that it is similar to jam, and jam keeps for ages. I imagine you could make this with other frozen fruits too. Peaches would definitely work, and raspberries would too, as long as you don’t mind seeds in your syrup. Now I want to go scout out some frozen peaches! 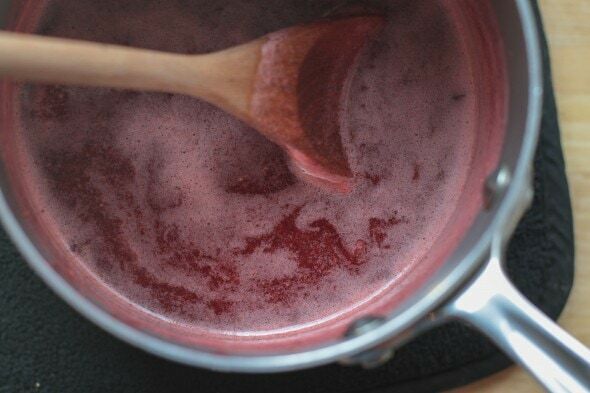 Combine pureed berries, water, and sugar in a small saucepan. Bring to a boil over medium heat, then boil, uncovered, for 5 minutes, or until syrup thickens slightly. Let cool to room temperature, then store in the fridge. If you’re looking for other cheap and tasty breakfast recipes, try this syrup on buttermilk waffles, buttermilk pancakes, or whole wheat buttermilk pancakes. We also make this with blueberries (add a little orange juice, as well as the sugar) and it is delicious on pancakes. And with the blueberries, you don’t need to puree them. After a while, simmering with sugar, they burst and thus puree themselves. I love to put frozen blueberries in my pancake batter then use regular syrup on top.Will try the syrup also, sounds delish! Let us know how that goes! It is still quite sweet with a cup, and I’m thinking less would work, especially if you added more berries in. If people like a thicker syrup, you can just add 1/3 to 1/2 less water. 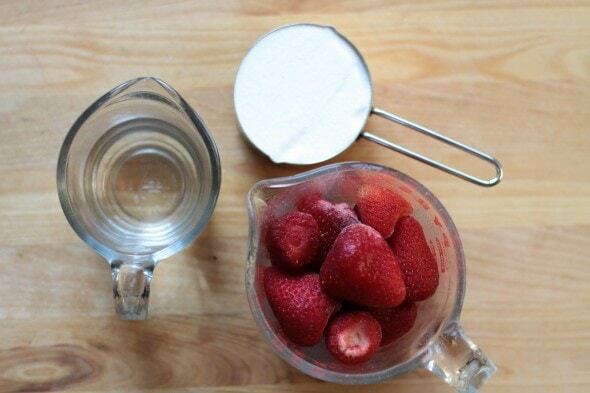 I have done this with raspberries, but I just pour it through a fine mesh strainer. One extra step, but it only takes 30 seconds. Easy peasy! This is great timing, I always make heart-shaped pink tinted pancakes for Valentine’s Day for my family. I have a ton of frozen peaches and just a few strawberries. I might try to put them both together. That way the technically peach flavored syrup will have a strawberry tint to it. Yum, thanks Kristen! If you have a chance to get a few raspberries too, that would REALLY make it brightly colored. Raspberries give off a lot more red color than strawberries do, in my experience. Oh, great idea! My kids eat raspberries like candy. Every year, there is a farm that sell strawberries. They cost $44 for a flat– which is 8 quarts. I buy as many as I can and freeze them. This isn’t necessarily frugal because I spend a couple hundred bucks in May buying strawberries! BUT, it gives me access to fresh local strawberries all year long. Right now, I’m making smoothies like crazy because I have a bunch of them and want to get last years gone by May. I figure 1. it’s healthy, 2. it’s local and supports small farmers, 3. it makes me happy all year long! So, this recipe is a good way to use them. Thank you! That’s so great! I think you’re doing something awesome there. Could you refreeze what you don’t use up within the week? Sure sounds delish and I have several bags of berries in my freezer that I need to use up. I wonder if adding a splash of lemon juice would help to keep the color a little brighter red? 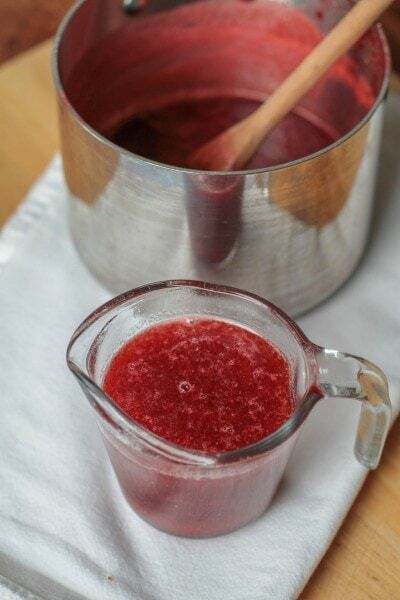 Not that the color affects the taste…I know sometimes jam or jelly recipes call for this addition. I add a bit of corn starch to make it thicker and more like a topping. Mix two tablespoons corn starch with about an equal amount of water, stir to make kind of a slurry, and then mix into the fruit/sugar/water on the stove before heating. Bring to a boil, stirring regularly, and cook a few more minutes until the mixture changes from being cloudy to a more clear and glassy look. And that’s it. It really changes the texture to make it more like a topping and less like, well, mushed strawberries. This sounds really good. I bet a triple berry combo (strawberry, blueberry, and raspberry) would be great. We do an orange sauce a lot (1/4c butter, 1/4 c sugar, 1 3/4 c orange juice) but this sounds like it would be great to mix things up. In a similar vein, you can make “banana syrup” very easily too! Take one very squishy brown banana and chop it into a microwave-safe bowl. Add approximately 1 Tb. of butter and 1 Tb. of brown sugar, cover the bowl, and microwave it on high for about a minute. Stir and microwave longer if you want the banana to disintegrate more. This makes a thick sweet syrup, plus it uses up those brown bananas that nobody wants to eat. Thanks. I bought some strawberries that ended up being too sour to eat plain. I tried this recipe with a little extra sugar and it came out great. We all loved it. I will definitely be making it again. Thanks for saving my strawberries. Awesome! So glad that you were able to save your strawberries. 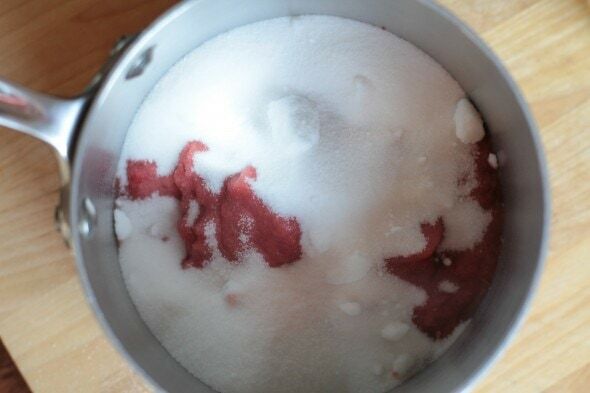 THANK YOU for this…I kept looking for an alternative to the store bought corn syrup junk for my kids. I made this with organic frozen strawberries and my kids were practically licking their plates. Now I know what my kids are eating! Has anyone added this to milk? My kids love strawberry milk.